As part of our Summer 18 India collection, the Brindisi 20 design features a simple but beautiful repeat motif which is based on traditional Indian woodblock prints. The most luxurious way to get some 'shut-eye', whether it be at home in bed or on a flight, our Brindisi 20 reversible silk eye mask has one side featuring our beautiful Indian motif print in blue and one side featuring the same print but in white. The inside is gently padded for a soft and comforting feel, whilst an elasticated silk strap ensures a great fit without being constricting. 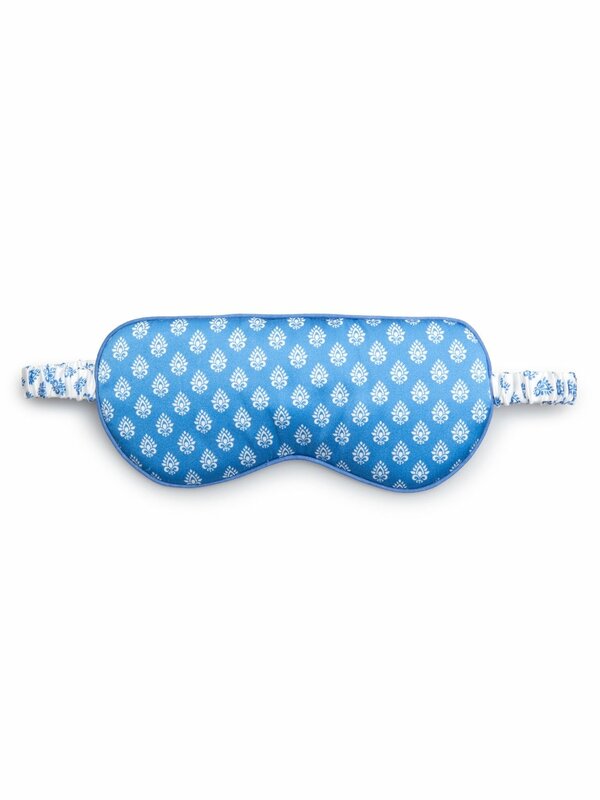 The reversible eye mask is also piped in a complementary light blue and comes with a fully-lined silk drawstring pouch which features the same Brindisi 20 print on the outside in blue and the same print in white on the inside. The pouch is finished with silk drawstrings for a final touch of luxe that makes this the perfect gift or just an indulgent treat for yourself.